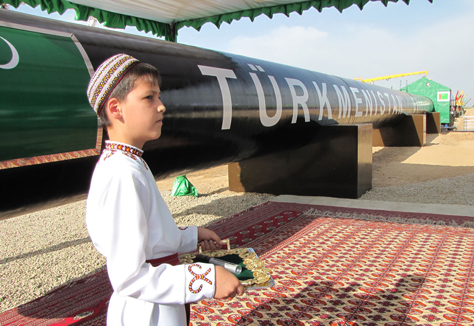 Foreign policy dictated by energy is helping to guarantee a future for Turkmenistan's regime. Arabian Oil and Gas. It's good being Gurbanguly Berdymukhamedov. The President of Turkmenistan's fifty-fifth birthday was not only celebrated with a perplexingly dazzling set of celebrations in the capital, but also coincided with the release of a five-volume epic 'To New Heights of Progress'- a series of speeches, recollections and pieces by the President himself. He also was re-elected President earlier in the year with over 97 per cent of votes- most impressive. But there's something amiss, and it's not just a lack of scepticism. For someone with such an impressive status within Turkmenistan, Berdymukhamedov has very little- if indeed any- international recognition. Granted, Turkmenistan is a small country of only five million inhabitants and its economy is around a quarter of the size of Manchester's. Most of the country is covered by the Karakum Desert as well. Yet herein lies the paradox- it may be surprising to find out that amongst other nations it is Libya with which Turkmenistan shares parity, both statistical and otherwise. Both nations are predominantly covered by deserts and have similar sized economies and populations. Its citizens are mainly Muslim, and retain a culture heavily influenced by a nomadic way of life that had pre-existed their respective states for hundreds of years. Yet Libya and its late leader Gaddafi need no introduction; contempt for his regime was internationally voiced once the internal situation deteriorated last year, and Gaddafi himself was repeatedly denounced by the P.M and the Foreign Secretary. Gaddafi's ridiculous cult of personality and whimsical idiosyncrasies have plastered tabloids for decades. Turkmenistan doesn't have the same press attention, despite having the 3rd worst press freedom in the world, just below that of Burma and North Korea. Given recent developments in Burma, Turkmenistan might soon have the dubious status as second only to North Korea- something the world cannot brush under the carpet. Berdymukhamedov's impressive landslide victory was certainly helped by this strangulation of opinion, not to mention the fact that all candidates running against him were from his own party. And if opinion isn't choked by this, rife torture in the prison system would certainly dissuade all but the most outspoken to voice their disillusion. The Red Cross was only allowed to visit a Turkmen jail for the first time this April. Berdymukhamedov didn't create this system; far from it, he inherited it from his Soviet-era predecessor Saparmurat Niyazov. Sasha Baron Cohen's 'The Dictator' may owe its creative inspiration to Gaddafi, but it is in Turkmenistan where the cult of personality is most vivid. Niyazov was President for Life, and appointed himself Türkmenbaşy- Leader of Turkmens. Although he abolished the death penalty and banned smoking in public places (after himself having to quit following heart surgery), the health of Turkmen citizens didn't improve considerably, for nearly all hospitals outside the capital, Ashgabat, were closed down in 2005. Physicians had to swear loyalty to Niyazov, replacing the Hippocratic Oath. More bizarre laws included the banning of opera and ballet for being 'unturkmen-like', the banishing of stray dogs from Ashgabat and the outlawing of men being able to wear long hair or beards. When he didn't ban things, he built his own legacy. In Ashgabat today there is a gold statue of the late President, which used to rotate to face the sun. Nowadays it rests standing- the extent of de-Niyazovisation under Berdymukhamedov. For all the regime's authoritarianism, there remains the question of why Turkmenistan is treated with such negligence. Britain's entire rhetoric is one of benign indifference. The only statement made by David Cameron on Turkmenistan came in the form of a letter addressed to Berdymukhamedov, encouraging 'closer cooperation in the field of energy'. It's void of any effort to even acknowledge the existence of quite serious issues, which makes Britain's whole orientation towards Turkmenistan not only euphemistic, but complicit. The answer lies beneath the surface; quite literally, Turkmenistan in recent years has been courted by energy-hungry nations for access to its huge untapped gas reserves, ranked 4th in the world. Owing to the fact that its production is only ranked 20th, there is a future cache to be secured, depending entirely on the benevolence of Ashgabat. This dictates an energy-orientated policy, and one which is not only unobtrusive vis à vis domestic issues, but which necessitates the long-term stability of the regime. Of course, the UK is not alone. José Manuel Barroso visited Ashgabat in early 2011, predominantly to voice a shared 'strong strategic interest in energy security'. Parallels can again be drawn with Libya. Britain's reorientation of policy in the last decade was seen as an insult to those who died at the hands of state-complicit terrorism undertaken by Gaddafi's regime. In recent years, the repatriation of al-Megrahi and fresh allegations of British compliance in torture of Libyan opposition figures have served only to remove any doubt of the toothless policy adopted by Whitehall. If the UK can undertake such a change of policy towards a regime which killed British citizens on British soil, then it should be no surprise that consciences aren't wavering over Turkmenistan. What's more, Whitehall doesn't want to encroach on a country which is firmly in Moscow and Tehran's spheres of influence. Iran has recently obtained a lifeline in the form of increases in Turkmen energy imports, and Putin telephoned Berdymukhamedov (who studied in Moscow during the Soviet era) to wish him a happy fifty-fifth birthday. Cameron's denunciation of Gaddafi was as shallow as Blair's rapprochement a few years earlier. Turkmenistan may not be a country that grabs the headlines or provides politicians with iconic sound-bites, but it is a country where the hypocrisy and spinelessness of governments is acutely felt through indifference. Judgement cannot be cast on the figureheads of regimes- Berdymukhamedov being no exception- when they are propped up, their egos inflated and their coffers aggrandised by complicit governments.